In this article we are going to cover Temporary Tables and Their Size. Get Temporary tables and their size. This script will help in maintain the temporary database in terms of size. 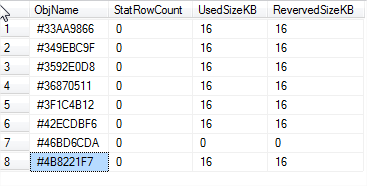 INNER JOIN tempdb.sys.dm_db_partition_stats AS STAT ON PART. INNER JOIN tempdb.sys.tables AS TBL ON STAT.object_id = TBL. Hope you will like Temporary Tables and Their Size.